Every major racing country has its iconic horse race. The UK has its Epsom Derby, the USA the Kentucky Derby, for France it’s the Prix de l’Arc de Triomphe, Australia the Melbourne Cup and Japan, the Cup after the country itself. There was something about this elite group of races that could not be matched by anything else, perhaps because of the acknowledgement that they are exceptional and represent the pinnacle of the sport. The greatness of these races lies in them being recognised and appreciated as events that helped raise and spread the popularity of the sport to a wider audience. And they have. Then in 1996, an idea born from a visionary horseman and leader, would forever change the racing landscape. The Dubai World Cup began life as an epic event, a concept race that would capture the imagination of the world and lure the best horses on the planet to compete in Dubai for the richest single purse in horse racing history – a prize of $ 6million and the honour of the title of champion of the world. As a passionate follower of flat racing His Highness Shaikh Mohammad Bin Rashid Al Maktoum, Vice-President and Prime Minister of the UAE and Ruler of Dubai, had visited every racecourse in the world and wanted to give something back to sport. As a result, he created the Dubai World Cup, a race that would bridge the racing world and internationalise a sport that has in many ways worked in silos. The Epsom Derby traditionally attracted British-trained contenders, the Kentucky Derby American essentially dirt specialists, the Melbourne Cup drew stayers based in Australia for the most part and the Arc, the best European types. The Dubai World Cup would change the way the racing world would view their sport. The inaugural running in 1996 lay down a marker luring horses bred in America, Britain, Ireland, Canada, Japan and Australia. History will reveal that the very first running of the race at Nad Al Sheba Racecourse in the heart of Dubai would set hearts on fire and begin a tradition that has endured for the past 24 years. 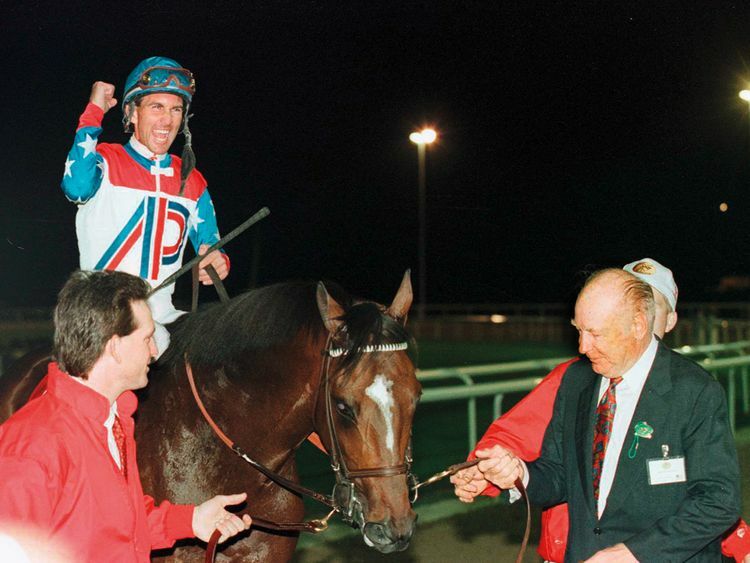 Cigar, ridden by Jerry Bailey, had won the Breeders’ Cup Classic at Belmont Park in 1995 and Shaikh Mohammad instructed the then Dubai World Cup management team to recruit America’s super horse to participate in his ground-breaking venture. The team, headed by the late Michael Osborne, a former senior steward of the Irish Turf Club and one of the leading figures in international racing in the past century, was chosen by Shaikh Mohammed first to establish international racing in Dubai which he did through the International Jockeys Challenge. As Chief Executive of the Emirates Racing Association (ERA) Osborne supervised the construction of Nad Al Sheba racecourse and successful launched the Dubai World Cup. And what a launch it was, immediately capturing the imagination of the world, with the quality of racing, facilities and unique hospitality. Never before had a single race meeting been able to woo and impress the hordes of international visitors, many of them royalty and celebrities, who were privileged to witness one of the most thrilling races ever run. Cigar would prevail by a whisker from Soul of the Matter following a heart-stopping eyeball-to-eyeball contest all the way down the home stretch. It was exhilarating and unforgettable. The Dubai World Cup presently resides at the pinnacle of horse racing. It is currently the richest and most prestigious race on the planet and still the race every horseman desires to win. To many it’s an Arabian adventure, given the heritage and warmth on display during the day. The setting may have changed dramatically from the homely Nad Al Sheba Racecourse to the majestic beast that is Meydan, one of the most recognisable and iconic sporting headquarters on the planet. Meydan is so enormous that many people have been known to ask, why are there only a few people here, when the numbers are actually around 20,000 to 25,000 on most race days during the season. Meydan’s majestic grandstand alone can host over 60,000 people and is capable of doubling the number on any given day. The positioning of the racing season at Meydan is perhaps another key to its success, with only Australia staging racing during the same time. The highlight of the Meydan racing season is the Dubai World Cup Carnival, worth more than $10 million in prize money across 10 race meetings, running from January to March every year. It is a season of high-class international racing, which is contested by the most high-profile trainers, jockeys and owners, not forgetting the best horses. It traditionally runs alongside the domestic racing season at Meydan season, which together with race meets in the country’s five other racecourse, make for an ultra-competitive circuit. Jebel Ali Racecourse, Abu Dhabi Racecourse, Sharjah Equestrian & Racing Club and Al Ain Racecourse are the other venues which boast equally excitement, though most of the races at Abu Dhabi, Sharjah and Al Ain are restricted to Purebred Arabian horses. The major prep for Saturday’s (March 30), Dubai World Cup day is the Super Saturday meeting, which was held on Saturday March 9, 2019. Super Saturday allows trainers to put the finishing touches to their equine stars before they reappears on the sport’s biggest stage — Dubai World Cup day. Being the official dress rehearsal for the Dubai World Cup, it draws a lot of attention worldwide as it in some cases, represents the final chance for a horse to qualify for the big day. But Meydan Racecourse has never been only about the action on the track. Spectators can gain free access to the racecourse on a regular race night or indulge in a range of competitions. Viewing options are tailored to suit any budget and the level of luxury from basic seating to five-star dining make the racing experience so very unique. But like the Epsom Derby, Kentucky Derby, Arc, Melbourne Cup and Japan Cup, the Dubai World Cup wouldn’t be what it is without the emphasis on the social side and the fashionable people who attend the race meeting. The annual Style Stakes competition, where men and women compete with each other to stake a claim to being the best dressed at the race meeting. Even the best hat is judged. Called the Style Stakes it’s all about elegance, creativity and grandeur and a vital cog in the big machinery that drives modern public events to a higher scale. So choose how you want to approach the day wisely and give yourself something to talk about and be talked about, even if you don’t own a horse.